How and why do birds evolve toward flightlessness on islands? The lack of predators on islands has allowed for a thousand species of birds to reduce energetically expensive flight muscles by evolving flightlessness. But most island birds retain flight. Ornithologists have previously treated island birds as a dichotomy: flightless birds with tiny flight muscles and long legs vs. volant birds with presumably unchanged locomotor morphology. However, my research shows that most island birds are evolving toward flightlessness. Using a comparative dataset of 868 species, I discovered that volant island birds have evolved smaller flight muscles than their continental relatives. I then measured over 1,600 museum skeletal specimens from 366 island populations to test which aspects of insularity were the most likely drivers of this pattern. Low predator richness best predicted the evolution of small flight muscles and long legs, suggesting that a lack of predators allows island birds to evolve along a continuum toward flightlessness. This pattern holds across a wide range of archipelagos and avian taxa, including at least ten families of birds that have never evolved flightlessness and which depend upon flight in order to forage (Wright and Steadman 2012; Wright et al. 2016). 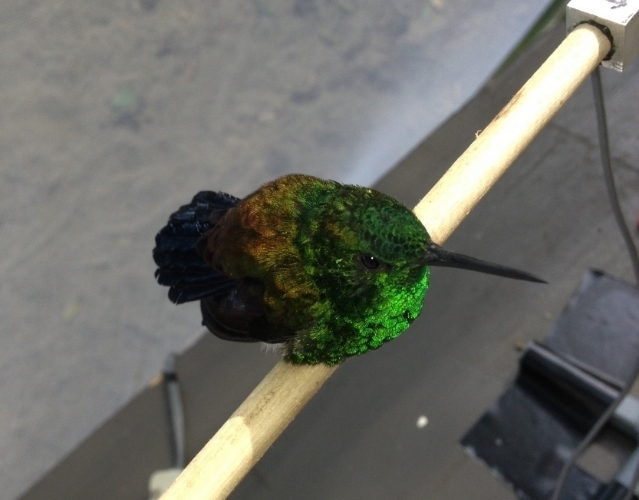 A Copper-rumped Hummingbird, Amazilia tobaci, waits to takeoff during one of my flight experiments on the island of Tobago. Birds on Tobago have smaller flight muscles and longer legs than their conspecifics on the nearby, larger and more ecologically diverse island of Trinidad. Photo by Natalie Wright. I am examining the biomechanics of takeoff in island birds to test how reduced flight muscles and longer legs affect performance. On the islands of Trinidad and Tobago I used a high-speed video camera and a custom-built force plate perch to collect data on takeoff biomechanics. I am analyzing these data to test how the smaller flight muscles and longer legs of Tobago birds affect their takeoff performance when compared to their larger-muscled relatives on Trinidad. I plan to extend this work to additional island populations, and to test how evolution toward flightlessness affects island birds' takeoffs, dispersal ability, terrestrial locomotion, and flight ontogeny. This work has implications for understanding why volant island birds are so vulnerable to introduced predators. It also may inform about the taxon cycle across island archipelagoes, potentially providing a mechanism for how and why birds lose dispersal ability after becoming established on islands. How does Predation affect flight development? With collaborators Bret Tobalske and Tom Martin, I am investigating how predation affects flight development in songbirds. I use 3D, high-speed videos of fledgling birds attempting to flee "predators" (i.e., researchers) each day for seven days during the fledgling stage to quantify locomotor performance. We are combining these data with Tom Martin's long-term data on nest predation risk and adult survival to explore the interplay among life history, predation risk, and flight development. Spotted Towhee fledgling displaying its still-developing flight and running ability. Several days after leaving the nest, the fledgling still cannot gain altitude via its wings, but those still-small wings do provide some thrust and lift. The bird engages both its legs and wings in its attempt to escape the researcher. Open-cup nesters such as this towhee experience high nest predation and strong selection for rapid growth to leave the nest quickly. When they leave the nest, they're still vulnerable to predators such as snakes, raptors, and coyotes, and (at first) aren't especially good at escaping. Video by Natalie Wright. 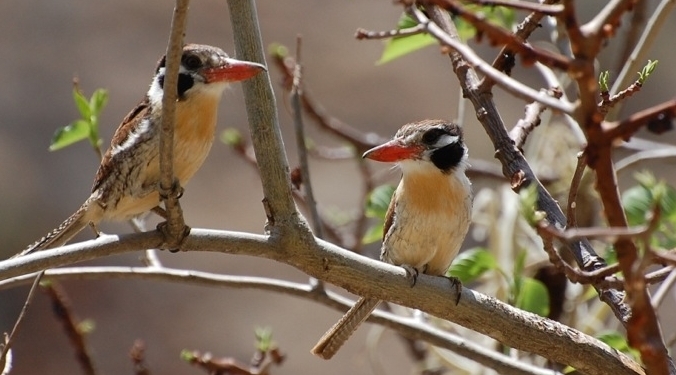 A pair of White-eared Puffbirds, Nystalus chacuru, in the Apurímac River valley of Peru. Photo by Natalie Wright. How does flight affect Genome evolution? Birds, bats, and pterosaurs all have smaller genomes than their relatives. Is flight the common driver of these small genomes? To test whether flight selects for smaller genomes in birds, I measured genome sizes of over 400 species of birds. I then investigated how different measures of flight ability, including heart size, flight muscle size, body mass, wing shape, and wing size, predict genome size in birds. Heart and flight muscle sizes best predicted avian genome sizes, indicating that the metabolic demands of flight likely drive smaller genomes in birds (Wright et al. 2014). Previous research on genome size evolution has shown that high metabolic demands select for smaller genomes, and in birds this seems to be related to flight style and ability. Additionally, we examined patterns of genome size evolution across the avian tree. Members of the coraciiform-piciform lineage (including kingfishers, woodpeckers, and their allies like motmots and puffbirds) have particularly large and variable genome sizes. With my PhD advisor, Chris Witt, in the Museum of Southwestern Biology collection examining some of the specimens used in our study on genome size evolution. I got my start in biology research as an undergraduate working in the Florida Museum of Natural History, where I gained an appreciation of how very much we can learn from such collections. Since then, I have prepared over 1180 bird specimens for research and teaching and have participated in numerous collecting expeditions in multiple countries. Much of my research relies on specimens I collect myself as well as specimens collected by others over the centuries. I believe wholeheartedly in collecting as much data as feasible per specimen, including study skins, partial skeletons, multiple types of tissue samples, blood samples, etc., to maximize data available per bird collected. The knowledge to be gained from scientific collections, when done properly, is nearly infinite.